Starting a new manga series always excited me, but then I realize how confusing first volumes often are. 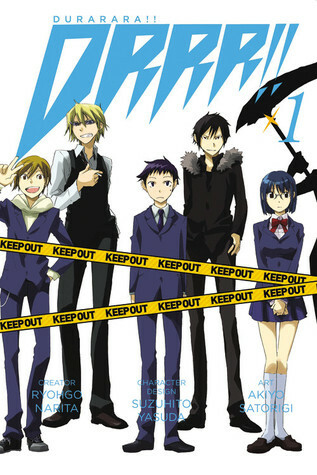 I had a hint of it before starting Durarara!! Vol. 1, because of the various characters in one city. The main character Mikado is a young boy who just moved to Ikebukuro and is reunited with his elementary school friend, but his friend seems to be wrapped up in some interesting characters. There's a legend of a headless motorcycle rider, whom Mikado has a close encounter with. I though this first volume was a great set up to some more complex story lines. I'm wondering how everything is going to fit together as well as who the headless rider really is and the purpose behind his being in Ikebukuro. There were a lot of moments of premonition and irony, giving a feeling to there's something big tying everything together. The illustrations are amazing and I did not have any trouble distinguishing characters from one another. Since there are so many, it can sometimes be confusing if the illustrations aren't awesome. Final Verdict: A decent start to the series, with enough mystery and intrigue to keep me reading. I'll be picking up the next volume soon. This sounds like a fun series. Nice review!